The subject of whether or not it's okay to re-wear pieces in the Instagram age that we're living in was recently broached on Who What Wear's Instagram feed, which got me thinking about my stance on the subject and how I get away with re-wearing the same things over and over. 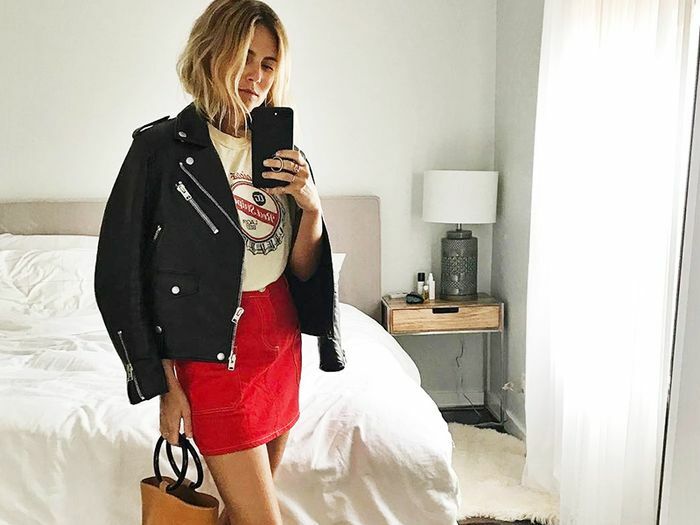 Since not re-wearing clothes probably isn't a thing unless you're a celebrity with a stylist who gives you with brand-new outfits every week, I try to build my wardrobe with staples that are cool without being instantly recognizable. So even if I happen to post a particular piece to Instagram more than once, I don't think twice if it's something subtle, such as a leather moto jacket like Lucy Williams is wearing in the shot above. But this isn't to say that subtle means boring, per se. Included in my mix of pieces I re-wear all the time are printed dresses, It accessories, and more. In fact, oftentimes my fiancé even asks me "Is that new?" about things he's seen me wear multiple times. Curious to see which pieces I re-wear on repeat without anyone noticing? Read on to shop them all and find out why I swear by them! No one ever says: "Wow she wears those jeans way too much." 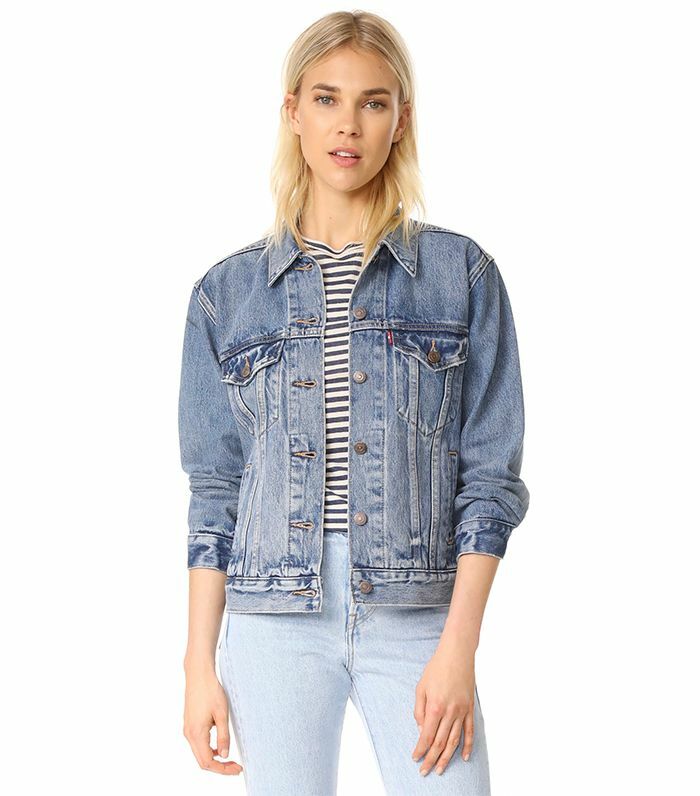 Denim jackets are sort of the same way. No one cares. Although it's printed, this gingham top takes on a neutral feel with whatever I'm wearing, perhaps because of its black-and-white pattern. Yes, this dress is red and covered in stars and ruffles, but if French girls can wear it on repeat, so can I. Of course you can wear this all the time—it's a plain white T-shirt. But take my word for it: It's the best plain white T-shirt. If you want a leather jacket that no one will notice you wear all the time, choose a classic one with minimal hardware. This is my go-to linen shirt in the summer. You can wear it so many ways: tucked into denim shorts on the weekends, over a swimsuit, or to work with a pair of high-waisted trousers. While statement shades are great for Instagram selfies, you'll wear a classic pair like this a lot more often. A classic wash and fit ensure that these flattering jeans will go unnoticed even if I happen to wear them several times in a week. You can and should wear your white sneakers on repeat (even some celebrities do). No one will care. This is a bold hue, but something about cobalt blue is eye-catching without being statement-making. I'd never hesitate to wear a brown leather belt on repeat, and I love that this one is a bit more special, thanks to the It logo. This cute little tote serves as a subtle accent piece as opposed to a statement piece. Something about Christy Dawn's easy dresses just makes me want to wear them all the time in the summer. So I do, and I haven't gotten any feedback that makes me want to do otherwise. When I don't want my shoes to compete with my outfit, I wear these. These are a little more exciting than black but just as unmemorable. Plus, they're really soft. Next up, shop the $35 dress that will get you so many compliments.